A few month’s ago, while in Carmel, I had what might be the best roasted chicken I had ever had out on the town at Hog’s Breath Pub. Maybe it was just because my husband and I were enjoying a weekend away together, maybe it was the wine, but either way, I couldn’t get the perfectly crisp skin, flakes of salt, and fresh vegetable succotash out of my head. So of course, I decided to recreate the meal at home. Of course, I didn’t actually know what constituted a succotash. I assumed corn, because every succotash I had ever seen had corn. Making this meal was a little on the fly, as I noticed the grocery store had a large bunch of fresh corn in. So I wandered through the produce section, picking up some okra and zucchini, because it looked good. Only later did I learn that succotash also includes lima beans, by definition. 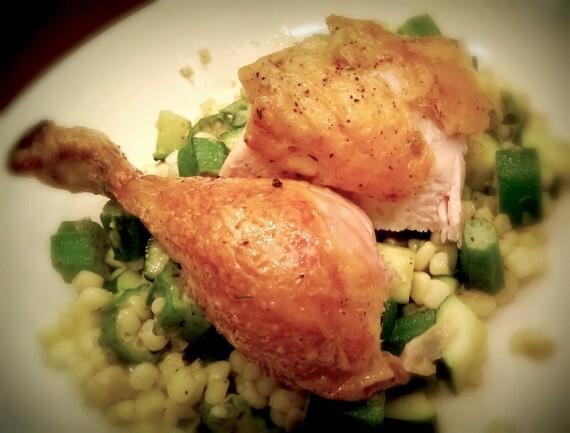 So we’ll call this Courtney’s sort-of-succotash, sans beans, but you won’t miss them. While I made this meal over a month ago, I’m thinking my final fling with summer might have to be a repeat of the entire thing, beginning to end. 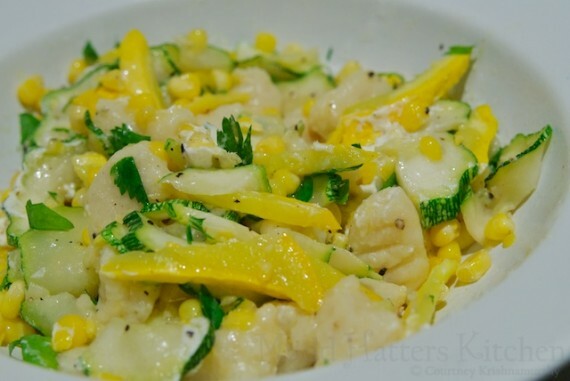 Either way, I know the final bits of squash my garden yields would be well-served in this amazing gnocchi recipe that lets each ingredient shine, feeling light but oh-so-decadent at the same time.